Designated Survivor will survive for at least the year. 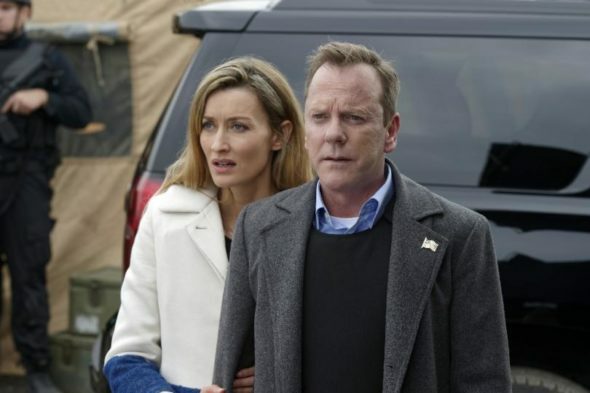 Variety reports ABC has given a full season order to the new Kiefer Sutherland series. The political drama stars Sutherland as Tom Kirkman, a low-level cabinet member who becomes the President of the United States after a massive attack wipes out the elected president and everybody else in the line of succession. The cast also includes Natascha McElhone, Adan Canto, Italia Ricci, LaMonica Garrett, Tanner Buchanan, Kal Penn, and Maggie Q. Only two episodes in, Designated Survivor has fared well in the ratings, earning an average of 2.02 in the 18-49 demo and 8.973 million viewers. ABC has ordered a full 22 episodes for its first season. What do you think? Have you seen Designated Survivor? Are you glad it’ll have a full season? I love Designated Survivor. It is a welcome break to see a clean, well thought out program. I would like to know when the second season will start. Love the show!!!!!!!! Can’t wait for season 2! It isn’t often I watch ABC series. But if I do it is so good to watch! Please keep the show if you don’t I won’t be happy among others people. You also have to think why ABC isn’t number one station. Because you guys don’t ever give a show a chance after the first season. I love it. I’m watching it on Netflix in Bangkok, Thailand. When will it continue? I cant wait for the next episodes. Very intriguing. Love Kiefer Sutherland, excellent actor. Very well produced show. Hope it does another season. Almost as good as The Family, which was wrongly canceled. So let me get this straight.The capitol has been destroyed. The president…..the congress…the supremes…all assassinated and the national media is obsessed by a cop in Michigan beating a Muslim teenager. The new president (and his wife) are more shocked & moved by his death….than the most devastating terrorist attack in human history. WOW!!! !